How To Create The Ultimate Food Display Using Bamboo Cones & Stands. Bamboo cones work great for showcasing snacks, appetizers and so much more. They have a modern stylish design, which means you can match them up with your other restaurant, party or catering event decorations and tableware. In addition, a bamboo cone can be filled up with a mixture of culinary goodies or a singular edible treat so you can use them on any type of buffet line or as centerpieces on your tabletops. Bamboo cones can be used to serve appetizers, desserts and much more. One way to use bamboo cones is to fill them up with fries and create a fabulous french fry buffet table. All you have to do is make your french fries, put them in different sized bamboo cones and place the cones in a classy bamboo stand, then feature the stand as a centerpiece on a buffet table. Another way to utilize bamboo cones is to fill them up with mini donuts and feature them on an attractive crescent bamboo stand, these stands look like little crescent moons, perfect way to add a unique touch to any food establishment. Let this crescent bamboo stand help you create the ultimate food display. You can also fill bamboo cones up with snacks like popcorn, nuts and chips, then put the cones in a full moon bamboo stand and set the stands on the tables around your bar or hotel. All your guests will love the look of the stands and be thankful for the yummy treats that you share with them. 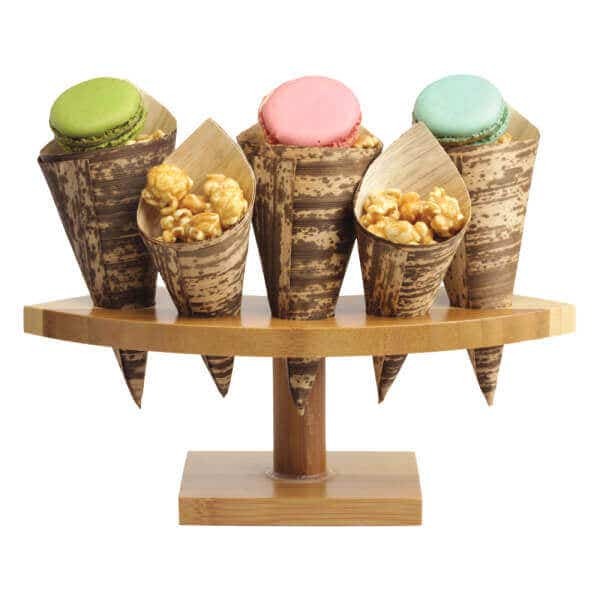 Bamboo cones and bamboo stands have a unique style and design, they add charm and class to any food display. You can easily put them on buffet lines or simply set them around on the tabletops in your restaurant or at your catering event and reach your goal – that is to create the ultimate food display for your guests to enjoy.